In the previous section , Data Drive with excel-2, we have explained the entire data driven capability and concepts, so this section would contain only information specific to YAML. The cucumber scenarios and step definitions are mostly same as that we have seen with excel, just the reading of the file is a little different probably few lines of code difference. Anyways, we posted an entire video and the project code base is available too, that contains both excel and yaml scenarios inside same project. 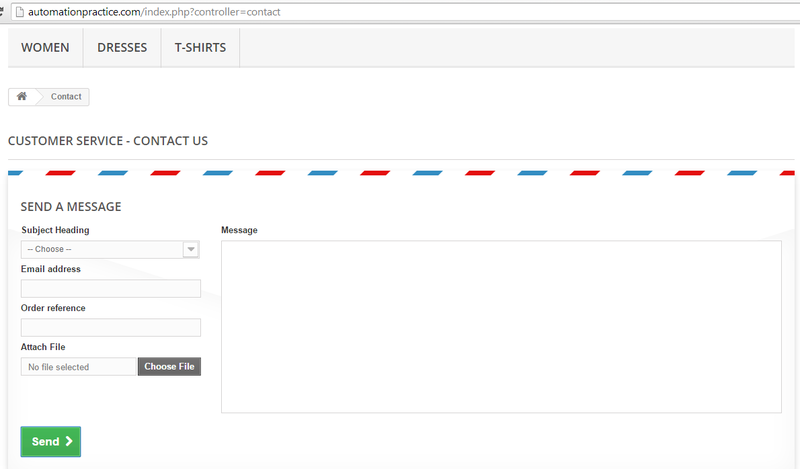 We will fill a contact us form on http://automationpractice.com website with different data sets. The contact form looks as below with many input fields. The simple cucumber scenario when written might look as below. I want to use the data from “DataSet1” of the excel workbook and I would go with the default yaml file “default.yml”. Feature: Fill a simple form with yml data Scenario: Data driven with yml When I open automationpractice website And click contact us Then I contact the customer service with yml dataset "DataSet1"
Then I contact the customer service with yml dataset "DataSet1"
We will use the data yaml ‘lib/config/default.yml‘ file and the file looks as below [We will post the entire project codebase at the end of this section in case you want to download the excel file]. We are also printing the current data set used by the scenario inside step_definitions, so that we know which data set was used. Then I contact the customer service with yml dataset "&lt;data_set&gt;"
Now we have a data_set which is a hash that contains the first data set from above yaml file. The step_definition code is posted at the bottom of this page, so you will know the exact values of the arguments inside the code. If you intend to change and use data from another yaml, then put the yaml inside ‘/lib/config/data’ folder and set it in cucumber.yml file as below. Let’s say your new yaml is “beta_data.yml”. This file will override the “default.yml” and the code will use beta_data.yml file.